It is a pleasure to be greeting all of you once again. It has been a while since our last newsletter and there is much information to convey. I trust all of you are having an enjoyable summer. 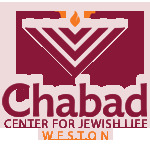 Summer will be over sooner than we would like and we will be entering a new year for Chabad of Weston. We are in the process of preparing several exciting new adult education classes under the auspices of the Chabad Jewish Learning Institute. We are also scheduling several Shabbatons with Scholars in Residence. Look for some of the preliminary information in this newsletter and watch for future announcements for more information. I encourage you to take advantage and make the time to participate in one or more of our many Shiurim. This is going to be our busiest year yet. These are exciting times and I urge you to take advantage of all we are offering. Do not be a spectator; get yourselves and your family involved and immersed in the overflow of Yiddishkeit flowing from Chabad of Weston. Our Shabbos Kiddush continues to be a highlight in our Shul where we can spend Shabbos afternoon enjoying the camaraderie we have built along with the food and drink and a Shabbos Vort or a Febrangen. Sponsorship of this weekly Kiddush has been most successful of late and I want to thank each and every one of you that has stepped up and made this a reality. Each personal date we commemorate, i.e. Bar Mitzvahs, wedding anniversaries, birthdays, Yartzeits, are many reasons for sponsoring a Kiddush. Please arrange for your sponsorship as early as possible in advance of the Shabbos you request. Also, these dates provide an opportune time to purchase a leaf on our “TREE OF LIFE” in the Main Lobby. If each of us purchased one then the tree would quickly blossom and be overflowing. On behalf of the entire membership I want to take this opportunity to thank Celena Chochron and Orit Fundaminski on running a wonderful summer camp. Their hard work and dedication has not gone unnoticed. If you are not yet a member of any of the above it is time to come forth and offer your services. Lastly and most critically, I raise the specter of financial difficulties. It is no secret that the past eighteen months have been finically challenging on a global scale; no less so for “our Shul“. For those of you that have enjoyed our Shabbosim, daily minions, Holiday programs, Shabbatons, classes, or other events and have not yet become members, it is time to do so. We need and value your support. I implore you to join our Shul membership NOW. To all our current members, we need you to encourage family, friends, and acquaintances to join. It is ultimately only thru our membership that we are able to survive and flourish. I wish all of you an enjoyable completion to the summer with good health and only good tidings. Perpetuate the Memory of a loved one by purchasing a Yahrzeit Plaque.